Customs Agents Search A Bus Near Paris — And Discover A Stolen Degas Painting : The Two-Way The artwork was quietly spirited from a Marseille museum in 2009. The trail was cold until last week, when officers happened to check the luggage compartment of a bus. During a customs check of a bus along a highway outside Paris, agents found a stolen Edgar Degas painting inside a suitcase. None of the passengers would claim it. An investigation was launched, but eight years went by and the 1877 painting — worth an estimated $1 million — wasn't seen again. That was until last Friday, when French customs agents happened to check a bus parked at a highway stop about 18 miles east of Paris. 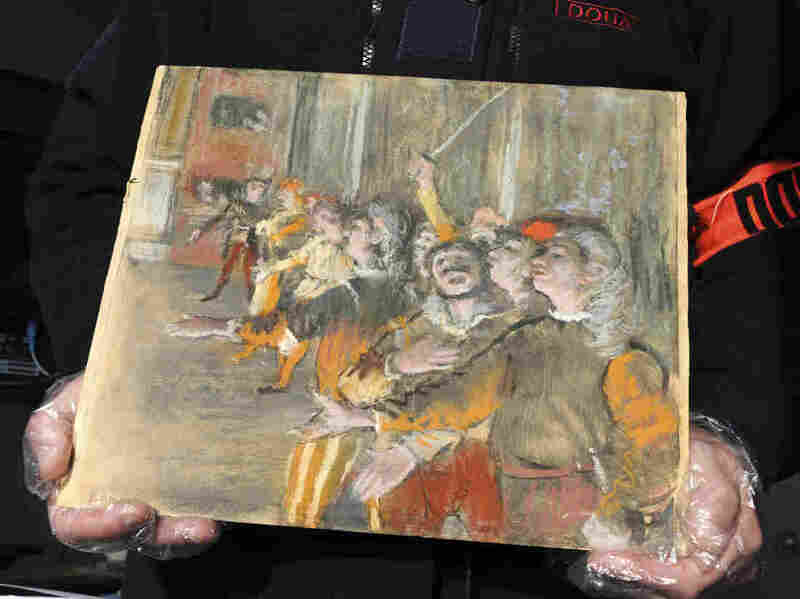 The officers opened a suitcase in the luggage compartment, and there it was: pastels in red, orange and yellow, depicting a chorus from the opera Don Juan. In the lower left hand corner: Degas' signature. The agents asked the bus passengers who owned the suitcase. No one claimed it. France Culture Minister Françoise Nyssen called the find a "happy rediscovery of a precious work belonging to the national collections, whose disappearance represented a heavy loss for French impressionist heritage." Experts at the Musée d'Orsay, which had loaned the work to the Cantini, confirmed its authenticity. The museum tweeted that it was "delighted" by the painting's recovery. As the culture ministry explains, Les Choristes is a monotype: "A printing process that is halfway between painting and engraving. The artist made an ink composition, brushed on a metal plate, before putting this plate in press." It is the only one of the ballet-obsessed artist's opera-inspired works that doesn't depict dancers. Next year, the Musée d'Orsay will show an exhibit called Degas at the Opera. "It would have been a terrible loss for us to do it without this painting," a museum spokeswoman told Agence France-Presse. French customs says it handled 71 cases in 2016, seizing more than 10,000 works of art, including coins and artifacts. That year, customs officers at the Roissy airport in Paris seized two 14th- and 16th-century marble bas-reliefs that Louvre conservators identified as likely looted from Syria. A previous version of this story incorrectly identified Edgar Degas as Edward Degas.